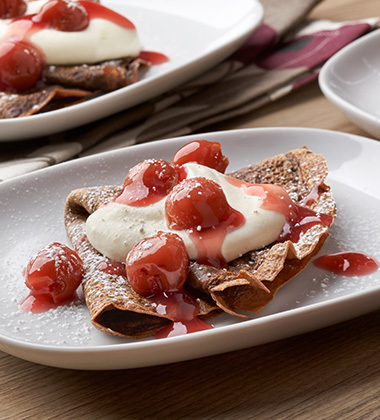 Sweet Chocolate Crepes topped with Whipped Cream and Sugared Cherries. Made with Campbell's® Healthy Request® Cream of Mushroom Soup, this decadent dessert is a perfect way to sweeten any holiday menu. vanilla extract	 1 oz. 8 1/4 tsp. unsalted butter, melted	 12 oz. 148 1/2 tsp. unsweetened cocoa powder	 7 oz. 148 1/2 tsp. sugar	 10 oz. 49 1/2 tsp. 1. 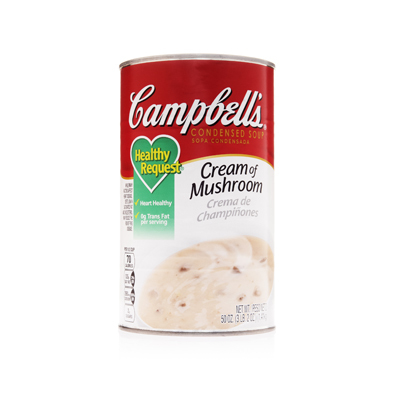 Place eggs, Campbell's® Healthy Request® Cream of Mushroom Soup, water, sugar, and vanilla extract in a blender. Combine at high speed until mixture is creamy and smooth. 2. Add flour and melted butter using low to medium low speed. Combine until smooth. Strain and set mixture in refrigerator for a minimum of 2 hours, preferably overnight to allow bubbles to escape. heavy cream	 66 fl oz. sugar	 4 oz. 24 3/4 tsp. 3. In a large bowl or mixer, combine heavy cream and first listed measure of sugar until mixture forms stiff peaks. Reserve. sugar	 2 oz. 12 1/4 tsp. 4. Drain liquid from cherries. Reserve. 5. In medium bowl, combine cherries and second listed measure of sugar. Allow to macerate for at least 20 minutes before serving. 6. Heat a 9" nonstick pan or crepe pan over medium heat. Spray with non-stick spray. 7. Add 2 fl. oz. of batter to pan and quickly swirl to form an even circle. 8. Allow to cook about 3 minutes, or until the top is dry and slightly lighter in color. Fold into a quarter circle and remove from the pan. orange liqueur	 0 1/2 fl oz. 9. In pot, combine reserved cherry juice and orange liqueur. Bring to boil and simmer over medium heat until reduced by half. 1. Using a spatula, place 1 crepe in center of an 8-inch plate. 2. Using two separate #100 scoops , top with 2 tablespoons of whipped cream and 2 tablespoons of cherries. 3. Drizzle with warmed cherry juice. Serve immediately. vanilla extract	 0.5 oz. 8 1/4 tsp. unsalted butter	 12 oz. 148 1/2 tsp. unsweetened cocoa powder	 6.5 oz. 148 1/2 tsp. Sprinkle lightly with powdered sugar to garnish if desired.